Today, Richard Rael and Tony Riggs tell the story of American astronomer Edwin Hubble. He changed our ideas about the universe and how it developed. Edwin Hubble made his most important discoveries in the nineteen twenties. Today, other astronomers continue the work he began. Many of them are using the Hubble Space Telescope that is named after him. 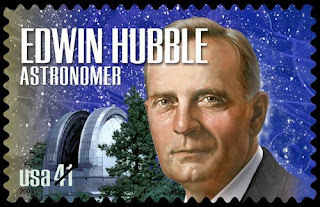 Edwin Powell Hubble was born in eighteen eighty-nine in Marshfield, Missouri. He spent his early years in the state of Kentucky. Then he moved with his family to Chicago, Illinois. He attended the University of Chicago. He studied mathematics and astronomy. Hubble was a good student. He was a good athlete, too. He was a member of the University of Chicago championship basketball team in nineteen-oh-nine. He also was an excellent boxer. Several people urged him to train for the world heavyweight boxing championship after college. Instead, he decided to continue his studies. He went to Queen's College at Oxford, England. In nineteen thirteen, Hubble returned to the United States. He opened a law office in Louisville, Kentucky. After a short time, however, he decided he did not want to be a lawyer. He returned to the University of Chicago. There, once again, he studied astronomy. Hubble watched the night sky with instruments at the university's Yerkes Observatory. His research involved a major question astronomers could not answer: What are nebulae? The astronomical term "nebulae," Hubble explained, had come down through the centuries. It was the name given to permanent, cloudy areas in the sky outside our solar system. Some astronomers thought nebulae were part of our Milky Way galaxy. Others thought they were island universes farther away in space. In his research paper, Hubble said the issue could be decided only by more powerful instruments. And those instruments had not yet been developed. In nineteen seventeen, the United States was fighting in World War One in Europe. Edwin Hubble joined the American army and served in France. Earlier, astronomer George Ellery Hale had offered Hubble a position at the Mount Wilson Observatory in Southern California. When Hubble returned to the United States after World War One, he accepted Hale's offer. Hubble was thirty years old. He was just beginning the work that would make him famous. In his first observations from Mount Wilson, Hubble used a telescope with a mirror one hundred fifty-two centimeters across. He studied objects within our own galaxy. And he made an important discovery about nebulae. Hubble said the light that appeared to come from nebulae really came from stars near the nebulae. The nebulae, he said, were clouds of atoms and dust. They were not hot enough -- like stars -- to give off light. Soon after, Hubble began working with a larger and more powerful telescope at Mount Wilson. Its mirror was two hundred fifty centimeters across. It was the most powerful telescope in the world for twenty-five years. It had the power Hubble needed to make his major discoveries. From nineteen twenty-two on, Edwin Hubble began examining more and more distant objects. His first great discovery was made when he recognized a Cepheid variable star. It was in the outer area of the great nebula called Andromeda. Cepheid variable stars are stars whose brightness changes at regular periods. An astronomer at Harvard College, Henrietta Leavitt, had discovered that these periods of brightness could be used to measure the star's distance from Earth. Hubble made the measurements. 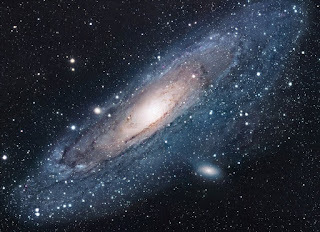 They showed that the Andromeda nebula lay far outside our Milky Way Galaxy. Hubble's discovery ended a long dispute. He proved wrong those who believed nebulae lay inside the Milky Way. And he proved that nebulae were galaxies themselves. Astronomers now agree that far distant galaxies do exist. Hubble then began to observe more details about galaxies. He studied their shape and brightness. By nineteen twenty-five, he had made enough observations to say that the universe is organized into galaxies of many shapes and sizes. As stars differ from one another, he said, so do galaxies. Some are spiral galaxies like the Milky Way and Andromeda. They have a center, and arms of matter that seem to circle the center like a pinwheel. Others are shaped like baseballs or eggs. A few have no special shape. Hubble proposed a system to describe galaxies by their shape. His system still is used today. He also showed that galaxies are similar in the kinds of bright objects they contain. All galaxies, he said, are related to each other, much as members of a family are related to each other. In the late nineteen twenties, Hubble studied the movement of galaxies through space. His investigation led to the most important astronomical discovery of the Twentieth century -- the expanding universe. Earlier observations about the movement of galaxies had been done by V. M. Silpher. He discovered that galaxies are moving away from Earth at speeds between three hundred kilometers a second and one thousand eight hundred kilometers a second. Hubble understood the importance of Silpher's findings. He developed a plan for measuring both the distance and speed of as many galaxies as possible. With his assistant at Mount Wilson, Milton Humason, Hubble measured the movement of galaxies. The two men did this by studying what Hubble called the "red shift." It also is known as the "Doppler effect." The Doppler effect explains changes in the length of light waves or sound waves as they move toward you or away from you. Light waves from an object speeding away from you will stretch into longer wavelengths. They appear red. Light waves from an object speeding toward you will have shorter wavelengths. They appear blue. Observations of forty-six galaxies showed Hubble that the galaxies were traveling away from Earth. The observations also showed that the speed was linked directly to the galaxies' distance from Earth. Hubble discovered that the farther away a galaxy is, the greater its speed. This scientific rule is called "Hubble's Law." Hubble's discovery meant a major change in our idea of the universe. The universe had not been quiet and unchanging since the beginning of time, as many people had thought. It was expanding. And that, Hubble said, meant it probably began with an explosion of unimaginable force. The explosion often is called "the big bang." Hubble's work did not end with this discovery. He continued to examine galaxies. He continued to gain new knowledge about them. Astronomers from all over the world went to study with him. Hubble left the Mount Wilson Observatory during World War Two. He did research for the United States War Department. He returned after the war. Then, he spent much of his time planning a new, much larger telescope in Southern California. The telescope was completed in nineteen forty-nine. It had a mirror five hundred centimeters across. It was named after astronomer George Ellery Hale. Edwin Hubble was the first person to use the Hale Telescope. He died in nineteen fifty-three while preparing to spend four nights looking through the telescope at the sky. Hubble's work led to new research on the birth of the universe. One astronomer said scientists have been filling in the details ever since. And, he said, there is a long way to go. This Special English program was written by Marilyn Rice Christiano. Your narrators were Richard Rael and Tony Riggs. Listen again next week for another EXPLORATIONS program on the Voice of America. 1. "_________________" was for centuries the name given to cloudy areas outside our solar system . 2. A star whose brightness changes at regular periods is called "________________" . 3. After his service in World War One, Edwin Hubble ___________________. 4. Our galaxy is called "The Milky Way". Hubble classified it as ______________________ . 5. Edwin Hubble's ancestors were _______________________. 6. Edwin Hubble was never __________ . 7. Light waves from an object speeding away from you stretch into longer wavelengths. _____________________ . 8. In order to make his most important discoveries, Hubble needed a mirror in his telescope ______________________ . 9. Hubble's Law states that the further away a galaxy is, ____________________ . 10. Hubble reasoned that, if the universe is expanding, it must have been expanding from the beginning, and ___________________________ . c: must have started with a huge explosion he called "The big bang".